We’ve done a couple of rounds of film series with various venues in and around the square with varied success. But this upcoming series feels like the eagle may have landed! 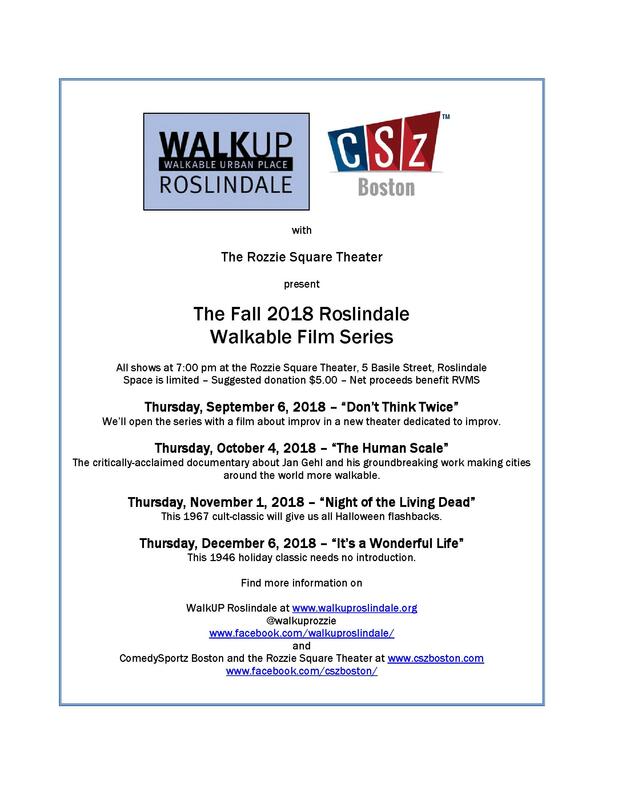 Accordingly, we are proud to announce that we are partnering with our new friends and neighbors at ComedySportz Boston and The Rozzie Square Theater to hold a series of films on the first Thursday of the months of September, October, November, and December. First up will be, perhaps not surprisingly, “Don’t Think Twice,” a movie about improv comedy in a venue primarily devoted to improv comedy! Suggested donation is $5 to help defray the cost of having the theater open for us and all net proceeds will benefit our friends at RVMS. We hope you’ll be able to join us, but don’t be late – The Rozzie Square Theater is an intimate venue with a capacity of 49 seats and we’ll be on a first come, first seated basis!! !